A vast majority of what we listen to today has been directly influenced by a cannon of elite artists. These seminal acts, most of which hail from the mid to late sixties, have come to be widely respected as they are routinely name checked by about every media source. And from the seeds of the original rock groups, there has been very little left in the way of innovation and invention. Because of this, so many groups over the years have mimicked, borrowed and outright copied the originators of the craft. Nico, of Velvet Underground fame, however, is one individual who was so devastatingly avant-garde that her albums remain, to this day, virtually unknown. In fact, her material was so unique that attempts at copying her sound have rarely been done. Rhino UK have just re-released The Marble Index and Desertshore, two of her best solo albums, in one package entitled The Frozen Borderline. The songs have been remastered and also included is a wealth of demos, outtakes, and alternate versions. These records are stellar and the recent mastering job that has been done adds a freshness to the sound that makes them even more incredible than they already were in their previous compact disc form. Nico had despondency by the throat. Her voice carried with it an absolute melancholy that does not fail to move the listener. If you only know her as the lead vocalist on three Velvet Underground songs from their first album then this point may not be apparent. Although the songs written by Lou Reed on that record are excellent, they do not suit her as well as the solo material that she wrote and recorded. To begin with, she wrote most of her songs on a harmonium, which is a pump organ that creates a stark, funereal sound. With this in mind, her songs are bleak, apocalyptic and entirely mirthless. Some dark material bears a certain amount of dry humor or tongue in cheek dejection, but Nico did not rely on such artifices. The Marble Index and Desertshore showcase this point well, but where her voice is intrinsically sad and her music innately gloomy, they carry no pretense. This is honest, unfashionable music performed by an artist whose soul is bared in a photographic manner and captured in these timeless snapshots of recorded material. The Marble Index was originally released in 1968 and it still does not sound remotely dated. It is one of those rare records that, if you play it to a friend, they will have great difficulty identifying the decade in which it was recorded. 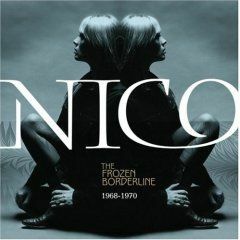 The songs were all written by Nico on harmonium and John Cale, also from the Velvet Underground, worked with her to create brilliant arrangements for her songs. The record begins with an instrumental piece called “Prelude,” which segues into “Lawn of Dawns,” an eerie composition that blends wind chimes, block percussion, sporadic guitar notes and a glittering of dissonant noises with the vocals and organ. The song alone reveals that she had rapidly moved on from the primarily folk-rock sound of her first solo album Chelsea Girl. She implores, “I cannot understand the way I feel/Until I rest on lawns of dawns/Can you follow me?” This is an example of the oblique lyric angle that she had taken as she became increasingly alienated from her public image. She had begun her career as a model before being presented to the Velvet Underground by Andy Warhol in 1966. This album is near the top of the list of records swathed in misery and discontent. There are no sing along, family tracks hidden within, however, it is not all darkness in The Marble Index. “Ari’s Song” is a somber yet sweet lullaby written for her son and “No One is There” is led by John Cale’s viola, lending the track, if anything, more of a classical feel. The proper album ends with a blistering epic called “Evening of Light,” in which a distorted viola comes in and out of the mix over a menacing harpsichord line that gradually rises in volume until the end where the album concludes with a final collision of discord. Desertshore was Nico’s third LP, released in 1970, and again she teamed up with John Cale for the recording. Although it is not as experimental or as powerful as the previous record, she provided more wonderful songs of desolation and unease. It is a much more stripped down record as it has nowhere near the arrangement depth from Cale, making it less dense overall. It is also a slightly lighter record in sound. For instance, there is the a cappella “My Only Child,” where Nico’s vocals actually sound serene without the incorporation of her harmonium. There is also the minute and a half “Le Petit Chevalier,” a harpsichord piece sung by her son Ari, who must have only been about four years old when it was recorded. “Afraid” is a plaintive piano ballad with viola that would have fit well on Nick Cave’s The Boatman’s Call album. The standout track here perhaps is “All that is my Own,” which has the most sophisticated arrangement on the album, even utilizing a droning trumpet in places. This song probably sounds the most like anything on her prior release. The many bonus tracks on these two cds are just as great as the album material, which tends to be rare amongst re-releases. There are several alternate versions and demos included, where the listener gets to hear songs in different forms as well as songs without Cale’s adornments. There are also a couple of unreleased songs from The Marble Index sessions that are superb. Nico’s albums, especially the earlier ones, are astonishing, but definitely are not for everybody. Her records are not ones that you will be hearing at your neighbor’s dessert party this weekend. However, if you are a fan of challenging, brooding and highly ambitious music, then you should without a doubt look into her solo back catalogue.